Be a better manager of your music queue. iTunes and the iOS Music app both offer Up Next, a way to queue up music you want to listen to. They work in very similar ways, allowing you to add music to the Up Next queue, change the order of tracks in the queue, and remove specific songs from Up Next. 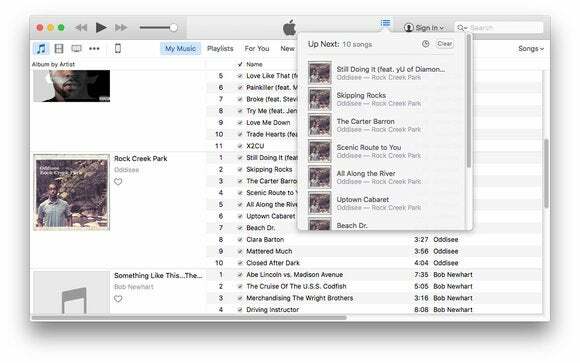 Let’s take a look at how to use Up Next in iTunes and the iOS Music app. Apple introduced Up Next in iTunes 11, which was released in late 2012. It was hard to get used to at first. 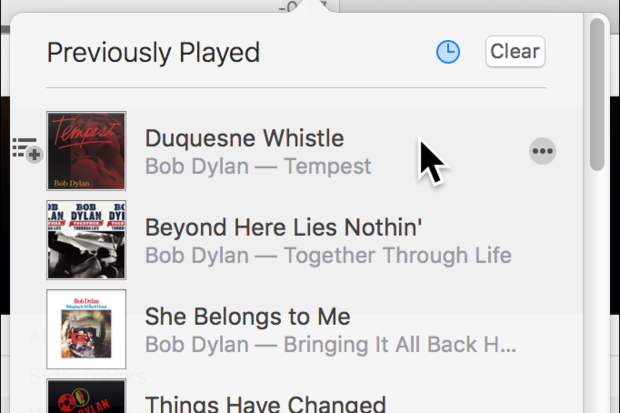 You may have previously used iTunes DJ, which offered a similar way of queuing up songs, and this earlier feature provided an interface that was easier to use, since it looked just like a playlist. Up Next, however, is only accessible from a popover in iTunes, making it a bit harder to manage. 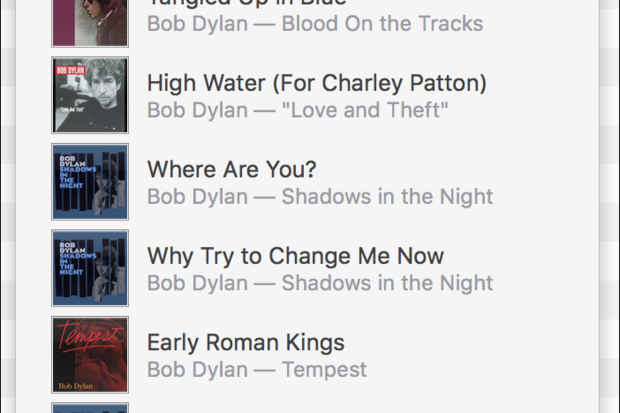 That popover isn’t very large, and it only displays a maximum of twenty songs. First, let’s get a handle on the concepts behind Up Next. In iTunes and in the iOS Music app, Up Next is always active. There is always a queue of songs waiting to be played, unless you start playing a playlist with just one track. The easiest way to understand Up Next is to look at how it works when you play a playlist. 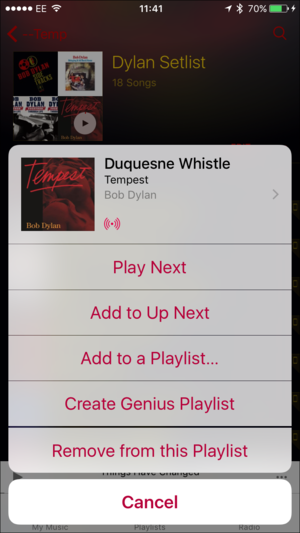 If you select a playlist and click the Play button, or double-click one of its songs, iTunes populates Up Next with that entire playlist, or with the selected song and all those that follow. You can view the Up Next queue by clicking the Up Next icon in the iTunes LCD. Here’s the Up Next queue for a playlist I just started listening to by clicking the Play button in its header. When you’re viewing the Up Next queue, you can delete tracks from the queue (this doesn’t affect the content of the playlist), or change their order. I’ve selected a track and I’m moving it down to a different position. You can see above that there is a x button and a ... button to either side of the track that I’ve selected and that I’m dragging. Click the x button to delete the track from the Up Next queue, and click ... to access a number of functions, including Play Next, to bump a track to the top of the queue. You can rearrange the play order by dragging a track to a new location. But what if you want to add more tracks to the Up Next queue? There are several ways to do this. Right-click or Control-click a track and choose choose Play Next or Add to Up Next. 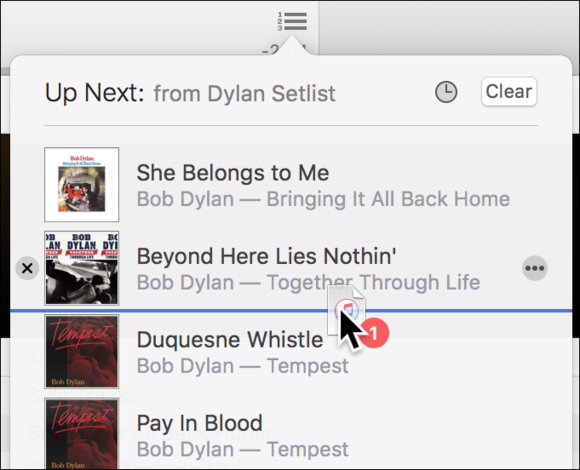 Drag items to the iTunes LCD; they get added to the end of the Up Next queue. 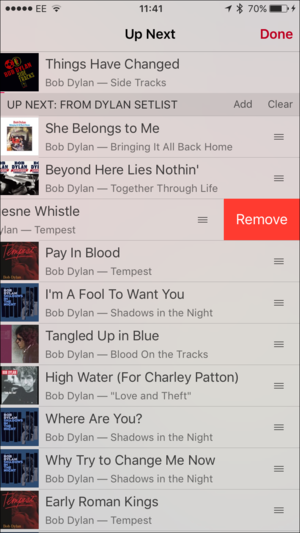 Hold down the Option key and click the small Add to Up Next icon that appears to the left of a track, or in the header of a playlist or album (the play button changes to the Add to Up Next icon). Click that icon to add the item to the queue. Select a track and press Option-Return to add it to the head of the queue; this is the same as choosing Play Next using one of the above methods. Note that you can clear the Up Next queue at any time by clicking the Clear button. If you click the clock icon in the Up Next popover, you can see your play history. You can add tracks to the Up Next queue again by hovering your cursor over a track and clicking the Add to Up Next icon that displays to the left of a track, or click the ... button to perform other operations, such as Play Next. See your play history by clicking the clock icon. iTunes stores your Up Next playlist when you quit the app. So if you relaunch iTunes, you can go back to what you were listening to before. 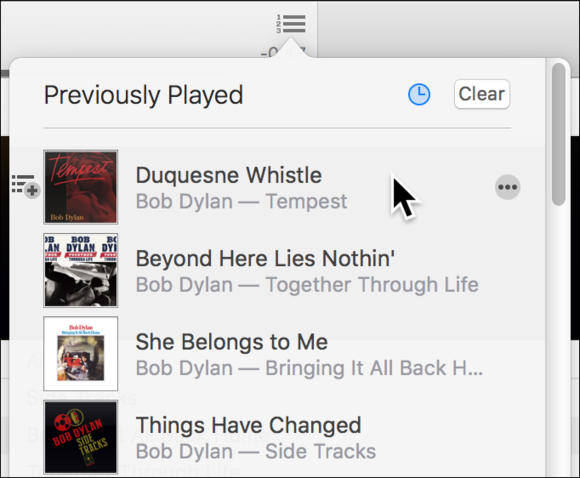 Just display the Up Next popover and double-click the first track to start playing your queue. Once you’ve understood how to use Up Next in iTunes, it’s simple to use the feature in the iOS Music app. While the menus are different, the concepts are the same. To view the Up Next queue, tap the Up Next icon when you’re playing music. I’ve surrounded the Up Next icon with a red square. Tap this icon to display the Up Next queue. You’ll see the Up Next queue, with the currently playing track at the top, followed by the rest of the queue. You can delete a track by swiping to the left and tapping Delete. Or you can move a track in the queue by dragging it up or down. Tap Add to search for and add any other track on your iOS device. Tap Clear to delete the queue. Here’s the Up Next queue on iOS. You can also view your Up Next history on iOS. 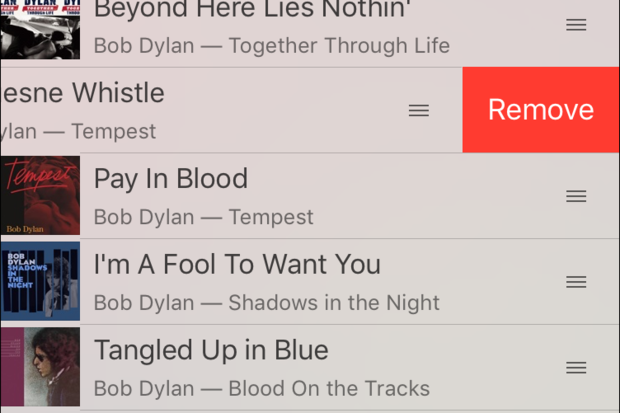 Just swipe down when you’re viewing the Up Next queue; you’ll see a list of the tracks you’ve listened to recently, and you can add them back to the Up Next queue, play them, or tap ... to get other options. 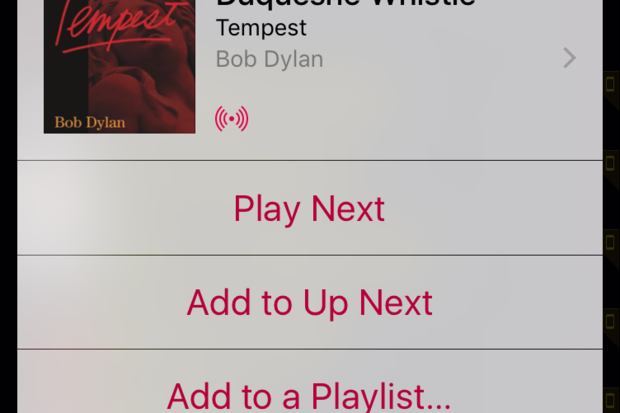 If you’re browsing your music library on your iPhone or iPad, you can add tracks to the Up Next queue with a few taps. Find a track, tap the ... button to its right, and a menu offers a number of options, including Play Next and Add to Up Next. 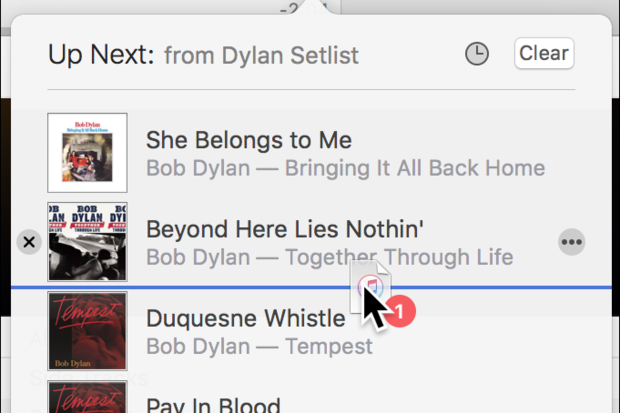 Add tracks to the Up Next queue on iOS. It may take a while to become comfortable with Up Next, but once you’ve mastered it, you can ensure that you’ve got a play queue for the entire day, in iTunes, and on your iOS device.